V.D. 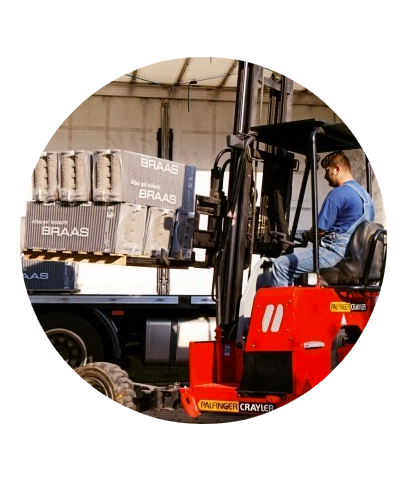 service is a company specialised in the repair & maintenance of fork lift trucks, telehandlers and mounted fork lift trucks. The 24/7 repair service is on site within 4 hours. Maintenance before or after normal business hours by arrangement. Substantial stock of original and high quality parts. This enables us to offer you good service under warranty. 75 % of the repairs are carried out on site. That way, the customer can observe what actually happens to his machine at all times. For a defect that cannot be repaired within 45 hours, a replacement machine is available free of charge for the duration of the repair (up to 7 ton and only fork lift trucks). Own revision department for transmissions, axles, engines, oil cylinders, poles, etc. We also have a substantial stock of exchange parts. We try to keep our travel and hourly wage charges as reasonable as possible for the service we provide. Our objectives are good service, honest prices and reliability. Please contact us - without any obligations - and we will be happy to help. We hope we will have the pleasure of working with you. Sale and rental of construction machinery. Please ask for more information.